Educanda is the partner of choice for all formal learning done through Day Cares, ECD Centres, Nurseries, Pre-schools, Primary Schools, High Schools, Special Needs Schools and parents. Educanda operates in South Africa, Namibia, Angola, Botswana, Zambia and Mozambique. To find out your 7 advantages when shopping with Educanda, simply click here. If you need expert advice, Educanda's Team of Occupational Therapist offers custom-made solutions incl. products & training that fit your specific needs. Complete this free advise me form to receive an instant solution! You can also phone 0800 86 96 73 or email info@educanda.co.za to schedule a free telephonic consultation. 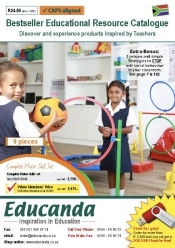 Educanda offers a one-stop shop with a wide range of educational products to support you in your daily teaching efforts. We value quality and durability. With the help of our extensive product range, you will be able to teach better, smarter and save time. We follow the official CAPS curriculum and offer key products for all grades in the subjects of Life Skills, Language, Mathematics, Science, Outdoor Play, School Furniture, Stationery, Electronics and much more. Are you not sure what to purchase? Click here and complete the "Instant-Solution-for-my-grade-form" and send it to info@educanda.co.za or fax to 088 021 556 97 14. Is this your first time ordering online? Don't worry click here to view a step by step explanation on how to order online. Take back your Classroom today! MORE THAN 6,000 teachers already gain the advantages.